The Vision Fitness T9600 treadmill offers a solid frame and large deck for taller and heavier users, and comes with one of three attractive consoles. You can pick a no-frills simple display for manual workouts, or get a high-end console that’s loaded with programs. In addition to the base unit, there are three consoles to choose from: Premier, Deluxe, or a Simple console. You can go with advanced programs and heart rate control, or go “simple” – no programs just readouts plus the speed/incline buttons. The Simple console is a Blue LED display with contact heart rate, standard console feedback (speed, time, calories, etc), and no programs. The Deluxe console (add $300) has a blue backlit LCD display with feedback in the window, plus contact & telemetric heart rate, and 10 programs, 5 custom programs, 5K, 10K, and the SPRINT 8 feature. UPDATE: The Vision Fitness T9600 has been discontinued and is no longer being sold. Check out the latest Vision treadmills to find a comparable model. The Vision Fitness T9600 treadmill comes with a number of quality components: heavy gauge steel frame, PWM with fuseless current limit motor control, and an internally cooled Cambridge Motor Works™ 3.0 hp continuous duty motor. The matching drive system and motor offers quiet performance, plus smooth, consistent power. The running area features an extra-thick 4.4mm orthopedic belt, 1-inch pre-waxed and reversible phenolic deck, 2.5" crowned rollers with large O.D. bearings, and a shock absorption system with 8 variable-durometer Elastomer cushions. Treadmill reviews are impressed with the Vision Fitness T9600. In fact, Treadmill Doctor nominated the T9600 Simple as runner-up in the Best Buy category in the $2000 - $2499 range. Current owners note their enthusiasm for key features such as the shock absorbing orthopedic cushioned running belt. They say that their experience on the T9600 is noticeably more comfortable and easier on the joints as compared to other treadmills. The deck is also reversible which will extend its life considerably. Overall, Vision Fitness has done well with this, their top-of-the-line treadmill, and expert reviewers feel it compares favorably to models made by Landice and Life Fitness. 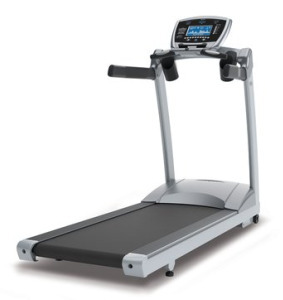 Prices for the Vision Fitness T9600 start at $2,499 and go up to $2,999. The base unit rates well in all areas – power, reliability, solid frame, noise level, cushioning, and walking area. Compared with other makes and models at this level, Vision makes a case for itself as being a competitor. When you are ready to buy, it is highly recommended that you go with an online retailer for a lower price plus Free Shipping. If you order the Vision Fitness T9600 treadmill directly from Vision Fitness, you’ll pay shipping costs on this bad boy, which will add about $150 to the final price.